This is John’s wife Gabi: Just to let you know that John is in hospital so won’t be posting at the moment. Yes; all the best and hope to hear from John soon; if only it would mean he has recovered. And Gabi; thanks for letting us know. Must be rough for you too. SPEEDY RECOVERY………..GABI TELL JOHN IT’S MIND OVER MATTER yes ..tnx for letting us know………..
Wow hope everything works out okay. Thank you for letting us know. Get well soon John. Thanks for the update; I thought a market comment the past few days was likely. Best wishes to both of you. Best wishes John! Get well soon! Thoughts and prayers are with you both. Please fell better soon. We miss you! a speedy recovery for you is on my wish list. Your work is important to all of us. Best wishes hope that you get better soon. Get well soon John. We will keep you in our prayers. I can only echo the well wishes; thoughts and prayers from the other posters and of course myself. Please chime in and keep us posted on his medical progress. I would be curious to know about his diagnosis; but that’s an aside. Personally I’m looking forward to reaching 70 this year; and my health is priority number 1; and I spend a lot of time reading and studying about how to stay well and avoid doctors and hospitals. Sometimes it’s a necessity; as seems to be with John’s case. My best. Get weell soon John. Thank you Gabi. My best wishes! Thanks for letting us know John’s status, may John get well soon and God Bless you and your family. hey gabi please pass on my wishes to john for his speedy recovery. god bless. A positive mental attitude will boost your immune system. I went through a rough period for 2 years and got through it by practising yoga and meditation. A trader’s life is very stressful. Every season i would get the flu something rotten. I’d be out for days/weeks. Now, i’m up and about after a day or two. Get well soon John. May the Solar Cycles be with you. I hope this is not too serious and John gets good care. You have to take care of your health frirst and foremost. My thoughts are with you. Get well soon John, take care! Yep, thanks for letting us know, Gabi. Wishing you and John all the best for a speedy recovery. Health and family is number #1. Get well soon. Get well soon John. I wish you the best! I am sorry to hear that he is ill. I hope that he gets well soon. My Best Wishes to you both. Sorry to hear that. Get well soon John. Will miss your updates. Get well soon, take care. John, Gabi, and Family . . Yes, prayers for a full recovery and thoughts of support from California. Gabi – hope you doing okay. I heartily agree with everyone’s comments. John, get well first. Other things come second, including your amazing work and this amazing website. All the very best to you both. Health before wealth,get well soon John! John, best wishes to you. Get well soon. Health is the most precious gift we have……… when we loose it. My prayers from Montreal are with both of you. John’s work is amazing and shared with such generosity. Hope he will get well soon. With God’s Blessings to you and your families! John, Gabi, and Family . . prayers for a full recovery and thoughts of support from the Netherlands. John, here’s to a quick recovery back to robust health. Best wishes to and your family. And thank you Gabi for letting us know. John, I wish you a full recovery to health and happiness. Thanks for all you do and share. I hope we can give back to you in well wishes. Thy name is my healing, oh my Lord, and remembrance of Thee is my remedy. Nearness to Thee is my hope and love for Thee my companion. Thy mercy to me is my succor in both this world and the world to come. Thou verily art the all bountiful, the all knowing, the all wise. Que te mejores pronto John ! Get well soon, John, take good care! John and family, my best wishes for you. I hope you get well soon. All the best and wishing you good health. A good strong recovery to you John. Thinking of you John and Gabi. Wishing you a speedy and full recovery buddy. All the best John, you rock ! Sending my best to you and yours, John. Get well soon. The market will always be there. thanks for letting us know. Will keep your family in our prayers. Hope John is back soon. Get well soon. All the best to you and your family! I n my other life as a slater we honor those who have fallen or are injured by getting back up there in the sky and talking of the missing as we work. A decade ago a well known trader fell seriously ill; I kept the conversation going for a year by posting examples based on his work. When he returned he thanked me.It is my thought that we honor the monumental body of work that John has so generously shared with us by keeping the conversation going, each contributing what they know best.. I will defer to the thought of others on this….Take care John. I agree. You and the others who post thoughts ancillary to John’s should continue to do so. Gabi, not I should speak for John, but I believe he would be honored for what he started to be continued while he is away. I will add as seems appropriate. Continued prayers and thoughts to John, Gabi and family. If only for your lovely family. Yes, I agree with slater9. John, I hope you’re back on your feet in no time. It would be ironic if markets turn down in earnest here and you’re not able to take a very well-deserved victory lap. Your well-written, reasoned and patient approach is sorely missed…. So sorry to hear it. Our prayers are with him. Hi All whats the set up for tomorrow? Speedy recovery … Get well soon! Best Wishes John! We will be praying for you. I have never posted here, but have visited often because of John’s excellent analyses. May God and his angels watch over you and protect you and your family. We are all praying for your recovery. Wishing a speedy recovery for you John. Thoughts with you, John, Gabi and your family for your speedy recovery. Sorry to hear that, thanks for letting us know and our thoughts are with you! Wish u a speedy recovery john.Get well soon,. In honor of John per Slater’s suggestion I want to share a post from Doug Noland. Doug has a very keen voice and intellect and has been touting the “Bear Case” for 23 some years… He’s made quite a career out of it. His most recent post observes fragility in China. And it was a year or more ago that John marked this time as critical regarding China. There is no doubt in my mind of the significance of John’s work. My only question which remains open is in regards to magnitude. Demographics keep me intrigued and I am constantly questioning offsetting behaviors to pure head count, for example women in the workforce, innovation, extended careers, etc. The correlation between SC and Sun Activity it is fair to say has been established. Thank you John. I continue to keep an open mind in terms of causation. It is a big leap from correlation to causation, but there is scientific and as well metaphysical correlates which suggest as much. We call it consciousness, which in my sideline as an astrologer the Sun symbolizes. Imagine that! The eye in the sky as a great puppeteer pulling our behavioral strings en mass, from one generation to the next. I cannot express my gratitude and wonderment enough for your contributions and your thought leadership John. Thank you again. Kudos John for your ground breaking and innovative contribution to investment and portfolio management. Doug will lay the blame of an impending collapse at the feet of debt and excessive monetary ease (intrusion) by central banks. John might disagree that banks are the ’cause’ but instead chalk it up to solar cycles and patterns of behavior through time which tend to repeat. Put them together no matter the cause is a scary proposition. John, All the best regards to you and your family. Thanks so much for letting us know, Gabi. Know that all the positive energy I can muster is being sent to John and family daily from my little corner of Uruguay. Best wishes for recovery, hopefully you will be back soon ! declines in March through April is now looking less likely with each passing day. really is not a big call to make at this stage – the short term outlook appears bullish. We have more than a month from now until the end of April, so let’s not get ahead of ourselves and call the coast clear. John wrote on Jan. 9 that the Dow had peaked at 16,588 on Dec. 31. So far, that call has proven to be absolutely correct. Until the Dow breaks 16,588, any bullishness regarding the major stock market indices is misplaced. There’s a first time for everything… and again John’s work in my estimation carries tremendous promise. That’s a fascinating comment from NASA – thanks for pointing it out. In fact, a higher second peak is very typical of the weak solar cycles (see SC16/12/5). Some commenters on John’s site have been comparing SC24 to SC16 for at least the past two years now – but NASA haven’t noticed the similarity yet! Ultra 909 and all here are great chartists………………i am LEARNING ALOT tnx for all the links ………..
Also wishing John a speedy recovery, with hopes it’s not something serious. Hopefully ”just” a case of burnout, in which case he’ll emerge stronger afterwards. Betting real money in the markets can be ever so stressful, a trader I know recently ended up in intensive care with arythmia. Due to large positions going against him, plus he’d endulged in a habit of snacking on liquorice. Turns out liquorice makes the body excrete potassium which our hearts needs to keep rythm. It’s high but not alarmingly, although it’s not updated since January (which is unusual). Interesting with this low solar cycle. The average curve have looked trunkated and flat for up to 50 months in earlier cases, which might bring us well into 2015 before a significant average downslope (in worst case). As per the ”similar amplitude solar cycles comparison” chart halfway down the page that eclectic posted some weeks ago. Regarding the declining volumes on the NYSE, it’s somethimg I cannot really understand. It’s said that up to 60% of the volume is due to high speed trading. Which would mean that either the HF traders are going elsewere, or most regular traders are inactive and staying (fully?) invested? In any case, the total “value” of stockmarkets is higher than ever, which means that when a decline comes the rush for the exit will be stronger than ever before (perhaps), since there’s not a market big enough in this world that could turn even half of that“value” into cash at any given moment in time. Which ofcourse says nothing about how long this bullmarket will run. And volumes seem not to indicate anything either (except for individual stocks). Exciting times. Are we seeing a bubble unfolding, or are we just approaching and passing the log midline starting from1973 (when gold was taken out of the equation)? I sure don’t know. The answer is perhaps that the chance is 50/50 as always, hinging on when a “catalyst” of some sort will tip the whole market. Sorry for this ranting excess! Regards and all the best to John and Gaby! Markets are now very precariously poised and losing upside momentum very rapidly. I doubt I am telling anyone here much they have not already observed themselves. DOW divergence remains, most indices are close to breaking 50dma’s again with some already doing so. The biotech bubble has well and truly broken. European and Asian indices, with the exception of the ASX well off their highs set earlier this year and now US indices are finally begining to crack. This will be no different to any other bubble top where the herd panic upon indices failing to play to their rules and make new all time highs, but instead break to new lows and thus set off a wave of selling that excelerates as margin calls and then panic ensues. This WILL play out exactly as John has anticipated it would. Cheers all and praying for you John. This chart just about sums it up for me. For many many months the SPX has displayed unfolding and ever increasing divergence in just aout every oscillator and indicator you want to look at. Coupled with ever increasing weekly volume since the 2011 lows, a classic sign of of final wave moves, combined with one of the largest gaps between price and 200wma ever that history shows will violently revert to the mean. Please let John know you all in in our thoughts and prayers. It is a legitimate question to ask why that number… ANSWER I am trying to step in front of the levels that i expect other traders to try to cover. exited in pre market leaving 50 cents on table. I could ask you a million questions but it would not matter. The strength in your system is being able to put it all together, not just pieces of info. I’ve been reading your blog but clearly have a long way to go, lol. How do I become a student? Where is the blog? Slater, your charts are pretty fascinating. teaching chart….. if you trade any length of time you will collect your own archive of this…. from my time 45 years ago canoeing the rivers of the Canadian north I named this set up ”RAPIDS AND WATERFALL” from the way the water tends to slick flat before it goes over the edge… three thrust lower with1>2>3 foloed by flat box….. the move over waterfall is expected to equal 1st. BUT NOTE…. IF PRICE MOVES INTO BOX ONCE AGAIN AND THEN FALLS OUT OF IT IT SETS UP AN ALGO CALLED THE ”LIGHTNING TRADE” which has as target new low…. having equal probability as 886 algo…. Slater & Gareneau, great stuff. S, how did u know traders would seek to cover gld at .486 area? Why not lower? You mentioned maximum downside? Can u show a chart? Is this tied to the golden cross? Or many inputs? John, Hope you are on the road to recovery. A lot of positive energy is being directed your way. Best wishes for a speedy recovery, John. We are all thinking of you. Gabi, any more news would be very welcome when, or if, you have the time. Look after him and your family first, though. We will always be here. On a personal note, I cannot tell you what a revelation John’s work has been to me. As for the markets, it appears that most of the month of March has been a choppy consolidation phase preparing for a blow off top that most bull markets experience in their final phase. This will be almost vertical! Though I sold all my long positions earlier in the month, I am re-entering today (50%) for an anticipated 100 point upwards move up in the SPX (17,300-17,500 on the Dow). Then it will be all over and I will go maximum short. It’s very difficult to time exactly, and I will set my stops accordingly. I truly believe John’s big picture analysis will prove to be 100% correct. tools I trade have market at make or break point… think by the end of day indexes will show their hand by moving decisively higher or lower….agree with Simon that if move higher it will be last gasp. if the bulls are able to take out both arrows they will be in control…. Well I for one am not convinced that this anything more than a bounce off what was/is a critical level for both the SPX, Trannies and DOW. The DOW remains below its Jan high. The Comp has broken its 50dma and Biotech looks horrible. I will be very surprised if this market holds up into the close. chart…. remember the number one way a signal is negated is if the very first thing that happens is an abcd sets up against trade,,,,, that is now in place,,,, that is why stop is break even and trade not allowed to become loss…. Are you thinking it will fall before the lunar eclipse on April 15? I was hoping it would run straight UP through April 11! Wishing you a speedy recovery John..thoughts and prayers are with you and your family. John, wishing you a speedy recovery. Apart from path breaking research posts by John and his open mind this site/blog gets brilliant visitors/analysts. I request every one to continue posting comments. Reading so many smart people is a Bliss. For Dow Jones – I consider period of Dec 2013 – May 2014 similar to Apr 1998 – Sep 1998 period. If this prognosis is correct we must see slightly higher high above Dec 31 Dow high of 16588 sometime in next 1 week? Once this higher high is done based on same past pattern we can expect 20-21% down slide in Dow by Mid May. Does anyone here work closely with ATR (Average True Range)? If you look at the 14 day ATR for the Russell 2000 on stockcharts.com, the measure hasn’t been this high since the 2008 crash. Yes, back then it was far higher but nonetheless we have broken to ATR new highs dating back to the beginning of the bull in March 2009.
the tools did their job… off the 886 algo price went to the first target line…. day traders covered…. now we must see if the longer term traders want to push it lower…. slater, right you are. I sit and see a large decline commencing next week. Expected to see more weakness into the close for the SPX but the Industrials and Compq looked weak enough. A big move commencing next week IMO. Correction – I meant since the significant bottom in October 2011, not March 2009. One of the things I look at coincident with major market tops is NASDAQ average true range. I monitor 20-day ATR measured as a percent of index close. I don’t have an absolute level where I am ready to pull the plug but the signature I look for is a trending set of higher highs and higher lows in ATR%. Since 12/31/2013 we have been doing just this but may be just getting started. Bear markets are volatile and are marked by high ATR%. Ongoing bull markets are usually marked by calm and decreasing ATR%. A major market top will have major rotation and this can lead to a stair stepping upward ATR% while the market is advancing or rounding off and this signature can be visible for months prior to an actual top. Did the trader address the situation where a very sharp intermediate break is expected without the expectation that the break marks the final top.? In his posts, John frequently referenced this work, the authors current thought..
Slater9, sorry for the delay in getting back to your question; as to whether the trader offered insight on ATR during periods of intermediate corrections vs major market tops – no, he didn’t. What was written here constitutes the totality of his comments so far as I know. I’ll look around for more. Demographics are a key part of John’s work. The area I live in was particularly hard hit after 2007… Yet now there are some interesting demographics…. There are thousands of jobs with no skilled or unskilled workers to fill the positions.At the high end, my friend who ran a robotics company closed shop and gave back the contracts he had because he could find no skilled workers… A t the low end, my friends who run the bakery down the street have contracts for 135 custom wedding cakes and have tried and failed for two months to find anyone to work in their shop…without help they can not keep up, In the middle, the oldest frame and body shop in my area closed Friday after 80 years at the same location after trying and failing for the last two years to find skilled help… I have a dozen offers to go back out to the world I love, being a slater … the older workers retired.. the younger people saw no reason to train for manual skill jobs… and even if they were willing, they are being offered wages similar to what I paid my crews 25 years ago. It will be interesting to see how this evolves. Slater9, the following comment / chart was made back on November 1st. The next chart shows that the 20-day Average True Range (measured in percent) of the NASDAQ has been making higher highs and higher lows. This is the signature of a significant top in the making. The absolute value of ATR is small but the trend is there… So I am expecting a significant pull back or the start of something larger that has either already begun or will soon. So far this year every time the market has pulled back was a time to buy. My guess is that this will continue until every investor believes it will happen again. Then the market will move against the masses. Is this the time? I don’t know. Every bear in recent history has been slain. thank you for taking the time to flesh out the concept. One final comment on the topic. The following observation was made back on May 3rd of last year. One could make the exact same observation of today’s market, EXCEPT for the fact that QE is being tapered back. Will that prove the difference vs how markets performed in 2013? The central bank liquidity and actions I am sure is what is behind the market action. However now I see a pattern that I have been watching for. The Average True Range of the NASDAQ is on an upward staircase pattern which was on the bottom rung back in mid February. This is a pattern I associate with a major market top in the formation process. ATR is a measure of index volatility and as yet the ATR is contained but showing the telltale higher highs and higher lows that have occurred at major market tops in the past. In 2007 we had such a pattern and also in 2007 as now the Russell 2000 is not sharing the major index tendencies of making new highs. We have a bifurcated market with small caps lagging. I show a first support cluster below the current price made up of the S2-Weekly Pivot, S1-Monthly Pivot, Quarterly Pivot, and S3 Daily Pivot with a cluster weighting of 11. This support cluster centroid is about 3% below the current price. Shown on the chart are the next level up and down pivot clusters with cluster values of 7 and 11 respectively. We may have entered a no-mans region between the first support and first resistance clusters unless we quickly get back above the first resistance cluster. The buy the dip mentality is most asuredly alive and well. One only has to watch talking head TV to know that. As far as I can tell, based upon a cluster of signs, along with John’s work, the top is in and the “btd” herd are about to be bitterly disappointed. No new higher highs and a taking out of February’s low will set the scene for a downside panic. Allan, we are a long way from downside panic. could take many months more. Phil, when I reference to a downside panic, I mean the commencement of one. Yes the final blow off panic would likely be several months away but all panics have a begining. I believe the highs are in. Momentum has been waning for weeks. DOW divergence aside, the Nasdaq, 100 index amd Russell small caps are now decidedly below their 50dma’s. The biotech bubble has also well and truly burst and downside will accelerate very soon thus carrying the S&P and industrials down with them. I believe that hindsight will show the Biotech sell off that commenced in late Feb was the begining of what eventually began the broader market sell off. Someone I follow is Gary Savage over at SMT. What he’s written this weekend is very interesting. He’s looking for one final and brutal smackdown in metals and commodities, as the stocks bubble reaches bursting point. John, I hope you approve of us taking over your blog. It’s all in your honor! Gary Savage (also known as Toby Connor) has one of the worst track records around. I consider him a huckster and a fraud. Clive Maund, on the other hand, is pretty good. But the single most accurate predictor of future financial market movements, in my experience, is Erik Swarts at Market Anthropology, who does truly outstanding fractal analysis. Thanks D.J. appreciate your input, as always. I have also followed Erik for a long time and I agree that his fractal work is unique and highly original. Clive Maund has made some poor calls over the years (which I acknowledge that he always corrects) but I can’t really rely on his judgments any more. Gary, aka Toby, has also been wrong numerous times, but I like his cyclical analysis. Do you read any of Robert McHugh’s work? He recently published a book entitled “The Coming Economic Ice Age” based on his multi-decade ‘jaws of death’ stock chart pattern. There are a lot of opinions out there, and knowing which to trust is difficult! That’s why I am here at John’s blog, because it is so unique, fresh, different, and unbiased. I really miss him! Over time I have gotten a number of excellent trade ideas from Erik Swarts…. and a few not so good…. the good ones were confirmed by the algo’s, the not so good were against the algo’s and in each case he stayed with his theme but shifted to a different fractal. Another good one… in JAN Erik was making a strong case for the outperformance of the FXA….bought the retest as marked with 20 cent stop…. as a trader took some off this morning…..
eclectic, what setting do you use on the weekly trailing stop if you don’t mind me asking? tia! “Here, Here”! to what D.J. is saying above. I can verify that Toby Conner has consistently gotten the direction wrong. BS baffles brains: sometimes. and to further discussion on John’s general topical theme. slater9 do you have a twitter or blog where you share your signals? Very interesting to learn about your 668 thank you. Time for you to sign out of the hospital John – we all miss you and hope Gabi and children are keeping positive. Absolutely. I think of you every day and pray you are in the mend. I keep coming back to this site looking for John. Hope you are on the mend. A while back I mentioned a market analog between the current market and what happened in the runup to the 1946 collapse. Michael J who pointed out this analogy continues to post on this idea $EWG pic.twitter.com/iAsmLS4osx and so far it seems to be working. The moment of truth approaches as we are on the edge of the collapse. argonaut, interesting analogy thanks. The European markets have of course been far weaker. The FTSE a point in case. Both the weekly and daily charts indicate to me that the FTSE is at decision point and must greak higher or face a large collapse. Yesterdays bearish candle does not auger well with price currently sandwiched between the 50 and 200 dma’s. What adds to the critical juncture at this point is that rice is also sitting just above the 50 week ma and right on the uptrend from the 2011 low. Also on the weekly notice the waning momentum on the MACD. I’m also looking for a minimum 38.2% Fib retrace, but a 65-70% move remains a distinct possibility in my view. What is the underlying similarities in macro environemnt that would lead one to compare the SPX in 1946 and 2014? Thx. Hello all. I had a burn out. I have now arrived home, and will post on the markets at some point over the next few days. Thank you so much for all the messages. Oh John great to hear you’re OK!! Take a good break and don’t come back until you are well and truly ready. So great to finally hear from you again! Really glad to hear from you. Hope you continue to get better. The arrival of spring will certainly help with the healing. Go slow and best wishes. Glad to know you are back! was worried about you. currently bleeding being short:)… Looking forward to your analysis. Welcome back John, Glad to hear your feeling better……. Great to “Hear your voice” and know you are out of the hospital. Hope we are safe in letting our darkest fears go now and that you are feeling stronger every day. and as gently as you need to. Welcome back John.Take your time to recuperate and then start afresh again. Go easy John. Welcome back. John, absolutely wonderful to know you’re on the mend. Each and every one of us has missed you….so much! Take care, buddy. Glad to know you are back john. Take it easy. Glad to hear you’re on the mend, John. As Alexa says, no need to rush – we’ll be here. John, great to hear you are back from hospital. Please take time to recover so new fresh ideas will surely appear. In the meantime I still stand for SPX 1630-1670 target and pretty soon. But if SPX and DJIA make new highs that needs to be forgotten. Take your time John to recover fully! That’s an interesting chart eclectic – thanks. Notice how SP500 did not start to decline until after the negative credit balance had been significantly unwound. That unwinding has not even started yet (unless during the past four weeks?). That’s one of the most astonishing charts I have ever seen. That final spike down to new lows recently could be the tipping point, as seen before. Chris Kimble does some great work. Looks like SPX400 could be on the cards, Fed or no Fed. This chart sits extremely well alongside John’s solar work. So good to hear from you, John. We’ve all missed you here and have been worried about you. Wonderful to have you back John! As a followup to the 1946 analogy. Michael J’s most recent charts are, if anything, quite striking. https://twitter.com/mjb4632. 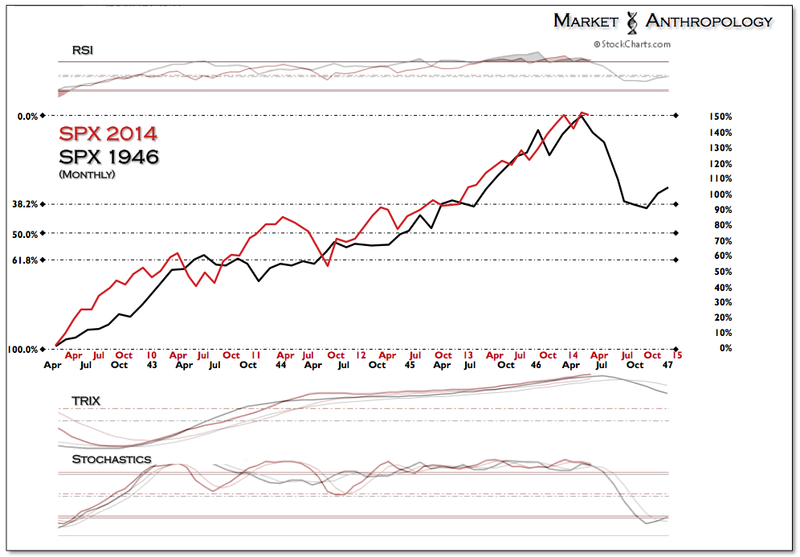 He also shows an eerie parallel between the Dow in the 1946 period and the DAX today. The logic behind the similarities between today and 1946 probably center on the great debt accumulation during war periods (WWII and Iraq, Afghanistan), the postwar shrinking of military expenditures and the geopolitical expansionism in Eastern Europe by Stalin. Many thx for shedding light on this. To Mark’s comment above about the SP500 not declining until AFTER the negative credit balance had been significantly unwound, this is exactly the point Jeff Gundlach of Doubleline made in his last conference call, i.e., he was not thinking any significant downturn in the stock market would begin UNTIL the margin debt balance had “hooked downwards”, using his term. So far, that has turned out to be the case. Good news! Welcome back, Mr Hampson. Another take to add into the mix…Martin Armstrong, based on his cycle theory projected by computer (AI) (not opinion), shows the global economy turning down fall 2015. The stock market is the only place to be…just have to follow the money as it moves to other markets and everything gets blown up…already seeing money going into emerging markets, some currencies. And now Yellen will do whatever it takes…so here we go. Nothing matters, until it does. MA was warning investors back in Feb to lookout for the end of March and April with a cluster of signals from his computer model indicating panic cycles in the Euro $,DOW and gold.???? Yesterday he posted an article about the markets going up and up???? Frankly it is not the first time he has done similar. He has merits but he certainly doesn’t hold the Holy Grail either. Remember John, as Auntie Mame says in the movie, “life’s a banquet and most of the poor SOB’s are starving to death!! !” Take your time to recover… enjoy your friends and family… indulge in your “banquet”. Wishing you and your family all the best. PS – I highly recommend you eat dessert first!! or a new high on the DJI possibly today. US jobs data today and later this week. not seeing a new DJI high. John, please take care…much success coming to you …..enjoy life for it is a long haul. $NYAD ha fully recovered….Europe stocks new high (as measured by Stoxx50) and EEM strength all pointing to stock prices not rolling over anytime soon. Yield curve starts to flatten but recession risk is less than a 2% chance 12 months out. Situation has changed. There is no reason to short now. I will focus on accumulating treasury in preparation for the next panic. .
T he past few days in GDX OFFER A RARE OPPORTUNITY.. to show most of the tools in my tool box in action in a very concentrated time frame….if my health permits, I will put together a teaching set… if not.. I urge traders to look at the past few days in the light of what I have shown. Trading in poor health is when I most often miss the forest from the trees… such was the case in the recent turn in bonds based on TLT.at the 886 algo….off that turn there have been targets hit but no reversal buy algo’s so far… the exact level of the turn holds out possibility on the longer charts of a new high in interest rates, new low in TLT…. Since you are an algo expert, and I believe you were posting on the Greedometer site, what do you make of his algo and his market predictions? Agreed – Slater, would be fantastic. So what’s next. 10-20% rise in Dow? All time highs so very difficult to predict where is will go next. Been heavily burnt on shorts so will shut at loss if the weekly close is higher than End of 2013 levels. Dows 31-Dec high remains intact … just! I found today’s action fascinating, Duncan. Dow refused to break above 16,588.25 from Dec. 31st. If I saw things correctly, it hit 16,588.05. Could Dow 16,588.25 be a mathematical amalgam of $1179.40 in gold (its June low which was severely tested but not violated in December), an absolutely inviolable number? We should know soon enough. a note… I allow the work of a few traders to influence my thinking… one of them is RAY MERRIMAN….his public work has referenced the importance of today if new high was made…given the fact that I will be away from the markets the rest of week in a potentially volatile environment, I closed out all but one position at the end of trading today. Slater, Ray Merriman, the financial astrologer? yes….all I ask of him is what I ask of all forecasters… give me trade ideas that no one else is talking about for reasons no one else is using.,,his work on weather and grains was the sole reason i went looking for the algo a few months ago in DBA..
We are very happy to hear you are well John. Get lots of rest. Now that it is getting warmer, one of the best things to do for our health, and many don’t know about it, is to walk barefoot on the grass or concrete for half hour or more a day. It is called grounding and has been shown to reduce inflammation, balance our hormones, reduce stress and more. I heard a lecture about it from this cardiologist who swears by it and says that it is the most effective way to fight heart disease, degenerative illnesses and more! Mae, picking up on your interesting topic, I love walking on the grass barefoot. It is very healing and therapeutic (so long as you avoid the mole hills!) I recommend John try this out if he can. But one of the very best ways to detox your body and start feeling well again is to juice raw fruit and veg. My wife has been doing this for three years and has not only lost a lot of weight, but has beaten diabetes and serious allergies. She has more energy and feels so much better. It has also been known to completely eliminate cancer cells. Interesting post about Merriman. Tks for the headsup slater9; and introducing the topic for discussion. Yes Simon, I look forward to walking barefoot again when the weather gets warmer here in MT. It strengthens the immune system – something that I understand the old Europeans knew about. I also make green smoothies with my VitaMix blender which has helped my health a lot because it is so much easier to digest for my body. Eclectic likes the far-infrared sauna. I have a BioMat Mini mat that I have my chair which puts out far-infrared heat and I also feel it is one of the best things for healing.